So, I'm well over a day late posting this one as it is, so it'll be a very quick one. This weeks OMCZ (Outside My Comfort Zone) challenge is shorts, trust me when we say outside my comfort zone, this really is. It's not the shorts so much, it's the fact that it being summer and all, I thought I'd wear them without tights underneath. I'll admit it I'm not the biggest fan of my legs, they are just the weirdest shape, so I try not to expose them too much. I mean don't get me wrong, if I'm going swimming, there's no way I'm going to let my silly insecurities stop me... but on a day to day basis, I'm not just going to wap them out for the fun of it! 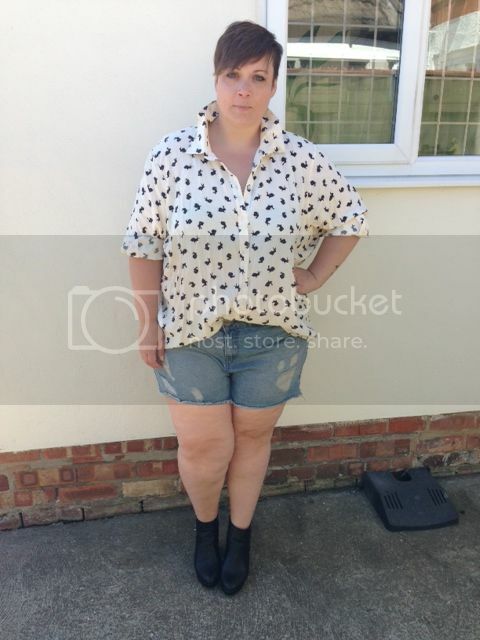 I wore my ripped denim shorts with the rabbit print blouse from ASOS and chunky ankle boots, I would normally wear this with tights quite happily, it's quite a casual, easy to wear outfit. How do guys feel about shorts? I'm not convinced when it comes to wearing them without tights. Do you love them or are they a big no-no? We have very similar legs, they've been the bane of my life. Even when I was 'thin' my legs were chunky. And I would rather walk over hot coals naked than wear shorts! Saying that you look great in them which makes me wonder if I could wear them... with tights of course!